Plaque for Kenneth W. Hunter, Jr.
A plaque for First Lieutenant Kenneth W. Hunter, Jr. (1922-1944), an Army pilot during World War II. Hunter died during his service in France and is currently buried at the Epinal American Cemetery and Memorial in Dinozé, France. He is one of 85 Florida residents interned at Epinal. Hunter was born in Jacksonville, Florida, on November 21, 1922. He enlisted into the U.S. Army Reserve (USAR) on June 10, 1942. Hunter was assigned to the 394th Fighter Squadron of the 367th Fighter Group, which was activated on July 15, 1943. The 394th Squadron provided air support in the European Theater for the invading Allied Forces. Hunter died as a result of a training accident on November 3, 1944. During his career as a pilot, Hunter received the Distinguished Flying Cross and the Army Air Medal with nine Oak Leaf Clusters. Digital reproduction of original plaque: War Department Files, National Archives & Records Administration, Washington, D.C. Copyright to this resource is held by the National Archives & Records Administration and is provided here by RICHES of Central Florida for educational purposes only. "National Archives & Records Administration War Department Files: 1 LT Kenneth W. Hunter, Jr." National WWII Memorial. http://www.wwiimemorial.com/Registry/plaque_wardept.aspx?honoreeID=1010846. "Aileen Louise Owen." FamilySearch. https://familysearch.org/ark:/61903/1:1:243Y-JHX. "394th Fighter Squadron." American Air Museum in Britain. http://www.americanairmuseum.com/unit/1009. 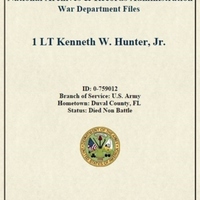 1 LT Kenneth W. Hunter, Jr.
“Plaque for Kenneth W. Hunter, Jr..” RICHES of Central Florida accessed April 19, 2019, https://richesmi.cah.ucf.edu/omeka/items/show/6529.